-High-flow, 100-micron stainless steel (coarse) cleanable element. Flows 2,000 lb/hr with a pressure drop of less than .15 PSI. -ORB-12 ports. Fittings available to adapt these filters to AN-12, -10 line sizes. -Pro-Series filters feature an indestructible electroless nickel finish. -High-flow, 100-micron stainless steel (coarse) cleanable element. Flows 2,000 lb/hr with a pressure drop of less than .15 PSI. -ORB-12 ports. Fittings available to adapt these filters to AN-12, -10 line sizes. -Pro-Series filters feature an indestructible electroless nickel finish. -7' long x 2.5' diameter An inexpensive insurance policy to protect your investment, proper filtration is key to fuel system performance. Engineered filter solutions are required to achieve protection with minimum restriction. 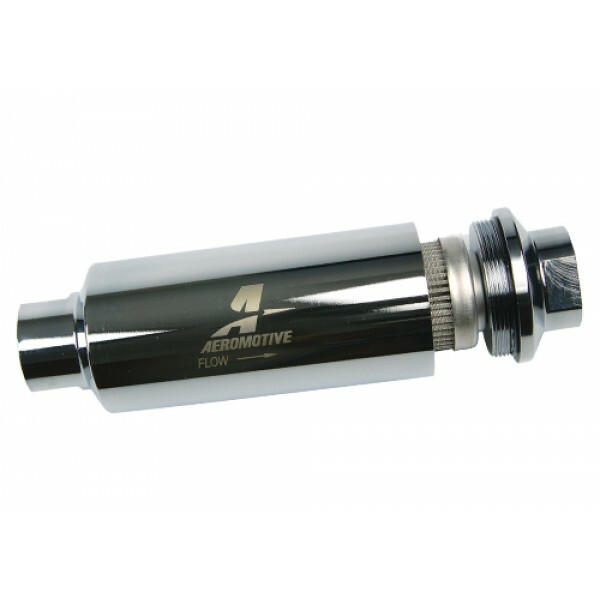 For 200 - 3,000 plus HP applications, our filter assemblies offer unmatched flow, ease of installation and maintenance, along with the impeccable machining and finish you've come to expect from all Aeromotive components.